An invite to an organic chocolate tasting and a 1 hour drive led me to a quaint cafe at Indiranagar where the tasting was held. A nice breezy evening and conversation over some tea and chocolate made me forget all about the horrid Bangalore traffic. We were all seated in a room and watched David and Angelika educate us about their passion – Earth Loaf. 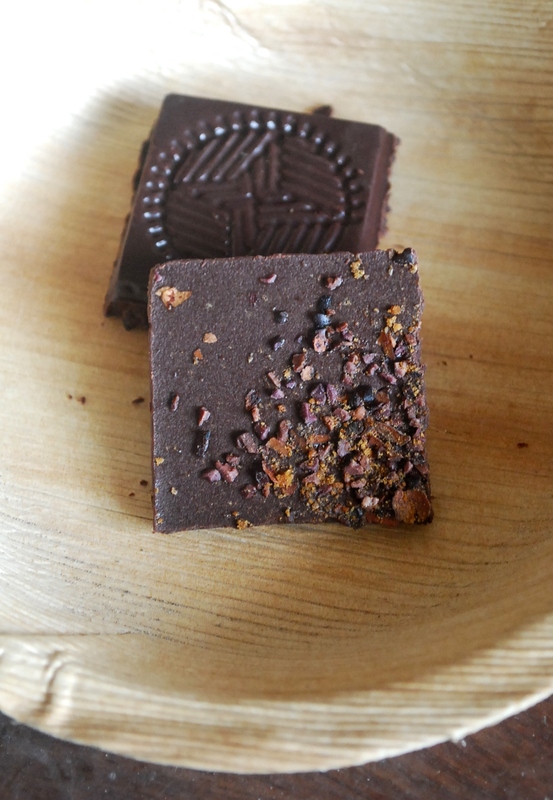 Earth loaf makes artisan raw chocolate and tea infusions. I was surprised to sip on a glass of pure raw cacao beans infused in hot water that tasted good to my liking. David explained that it is a good energizer and a perfect post lunch drink. Earth loaf also has a blend with Assam tea leaf and cacao beans. David and Angelika come from the background of cocktail mixing. Their true calling for raw organic food lead them to experiment with chocolates. Earth loaf is based out of Mysore and currently David is busy training two women who come to work with him from a nearby Village. It took about two years to source and make their own machinery to produce the finest quality of handmade chocolate, right from scratch. David believes that chocolate is addictive due to its sugar content and he wants his customers to experience the opposite in his product. He believes that by adding minimum amount of coconut sugar, he is giving a pure taste of cacao rather than a sugar overload. David believes that it is more sustainable to go local (Indian) rather than sourcing it from abroad even though he may be tempted to. The raw materials are all procured from South and the ingredients used are minimum. 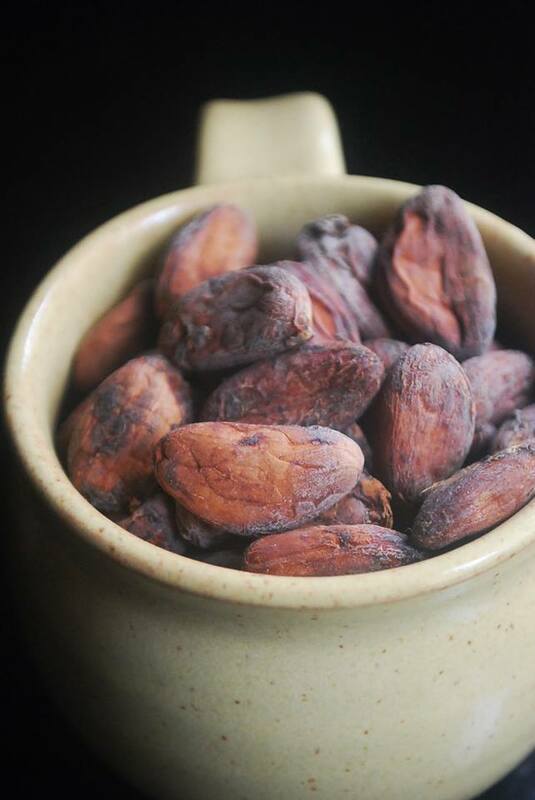 After all this talk about raw chocolate and cacao beans, many of you must be wondering that what is cacao beans…. Cacao beans may look like an almond and comes with a thin skin covering. This skin can be removed by hand or soaked in warm water to discard the skin. Large processing house use machine to remove the skin covering, David built his own machinery to remove the skin. These beans are then crushed and are called cacao nibs, which is used as a garnish or are processed into making chocolates. Cacao beans is particularly found to be very healthy for its flavonoid content. The darker the chocolate the better flavonoid content is has, which helps to prevent diseases Cancer and Alzheimer. 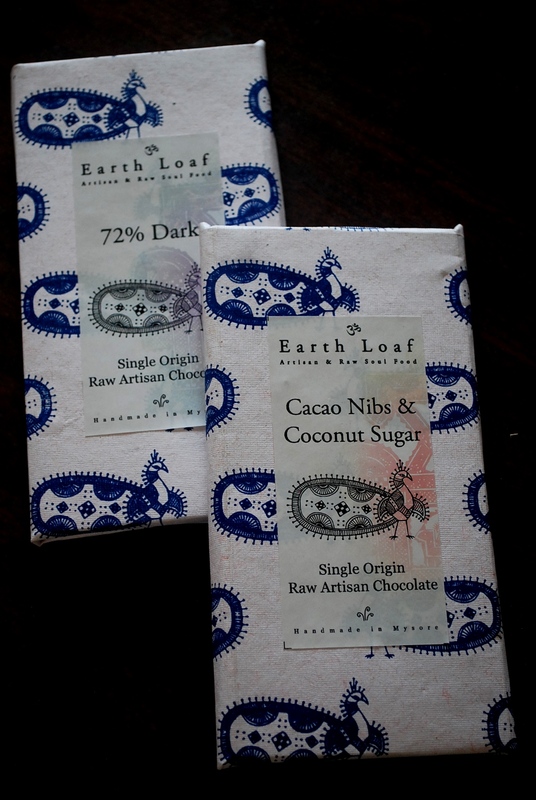 How is earth loaf chocolate different from the conventional dark chocolate? Earth loaf chocolate is made with minimum ingredients and doesn’t contain any milk solids. 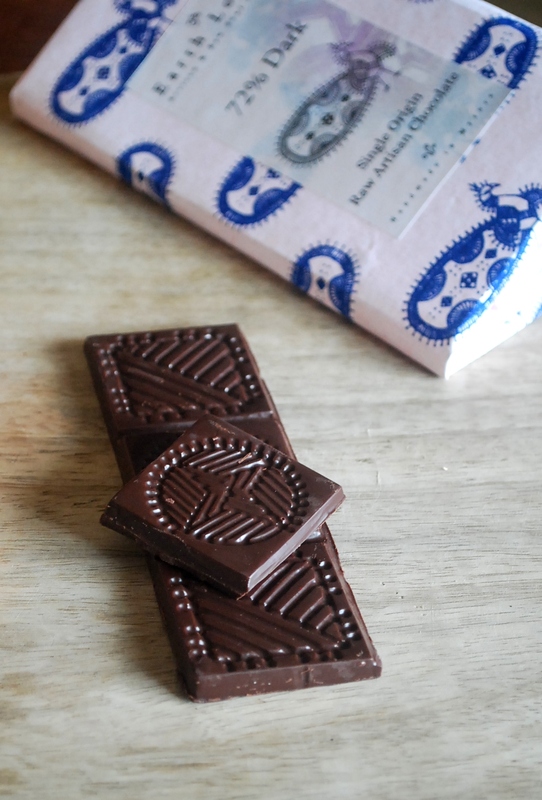 This chocolate is made from pure raw cacao and is also vegan. Most of the conventional chocolates are so highly processed that they tend to lose their nutrients and antioxidants. More on raw chocolate and coconut sugar. Raw chocolate with cacao nibs and coconut sugar sprinkle. Earth Loaf products will be soon available on i2cook.com. You can also shop at their online store. Diabetics has been on a rise and it is essential that we start looking at what we eat in a more organized manner. Today’s lifestyle demands us to focus on our health and take pre-cautionary measures before its too late. I had spoken about GI with regards to natural sugars before and now I will be talking about it more in detail . GI is a term most often used by nutritionist but in today’s date and it has become important for a layman like us to understand the importance of it. Following a low GI diet for a healthy living will help you keep your glucose level in check. Glycemic index (GI) is a measurement of how quickly sugars from food enter your blood as glucose. High GI results in high levels of blood glucose and low GI results in slower absorption of glucose with fewer changes in blood glucose levels. The GI ranking is from 1-100. Apart from regular exercise, food plays a vital role in keeping us healthy. Today’s post is about low GI foods that are beyond natural sugars. Everything that we eat contains some amount of sugar in them. Why do I need a low-GI diet? A low GI diet ensures that you are a more active person. The lifestyle that we have right now as compared to our ancestors is not the same. Our grandparents may seem active even at the age of 80 but there is no guarantee that the same genes will carry on to us. The reason is very simple – lifestyle and introduction of packaged products to make these products last long has become a part of our daily diet. The carbohydrates that our ancestors ate were to basic beans and rice which made it easier from farm to plate due to the lack of refrigeration or processes packaged products. As a result, most of the food that we eat like pizza, burgers, cakes contains the sorts of carbohydrates that break down quickly and release their sugars rapidly into the bloodstream. However, consuming low GI foods will help us keep fit and active. Weight gain – high GI foods will make you hungry and more likely that you will want to eat again. It also causes blood sugar levels to rapidly rise and fall, which in turn results in craving for sugary and fatty foods. In both cases insulin’s main role is to promote fat storage, which means that the more insulin you have in your body, you are storing excess calories in your body. 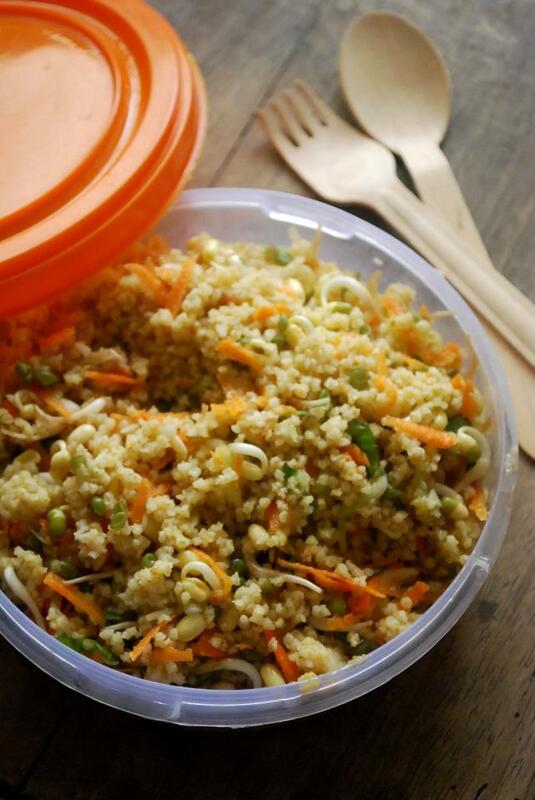 Foxtail millet salad loaded with veggies works best for a busy afternoon meal at work. Obtain a high fibre diet by consuming rolled oats, leafy vegetables, fruits. It is naturally more filling and makes you feel full for a longer period of time. Consuming nut butters like peanut butter or cashew butter keeps you full for long. Vegetables and fruits are rich source of nutrients and can help fight diseases. Higher in essential vitamins,minerals and antioxidants will help your immune system stay strong and healthy. How to follow a simple low GI diet? A low GI diet is not that difficult to follow. In India, it is much easier to achieve this as we cook our own food (most of the time). Eat different types of fruits and vegetables about 6-7 servings per day as per your liking. Although, some fruits and vegetables may contain high GI, in relaity when eaten in normal quantities they contain small amount of carbohydrate that they have little or no measurable effect on blood sugar levels. Nuts and seeds are a great source of essential fatty acids. If you think that nut butters are fatty, think again. Eating fish or seafood 2-3 times a week is a good source of omega 3. Eating lean meat or chicken, minus the fat and following healthy cooking styles like grilling or barbecuing is best way to enjoy meat and control your GI. Snack on low GI foods like fruits, ragi/millet chips or crackers, coconut sugar biscuits or low fat yogurt. Following simple steps and taking tab of what you eat can help you a long way. GI-diet is not a fad but a scientifically proven theory. Taking smaller steps and planning your meal by swamping basmati rice with millets or white bread with whole wheat bread will help. 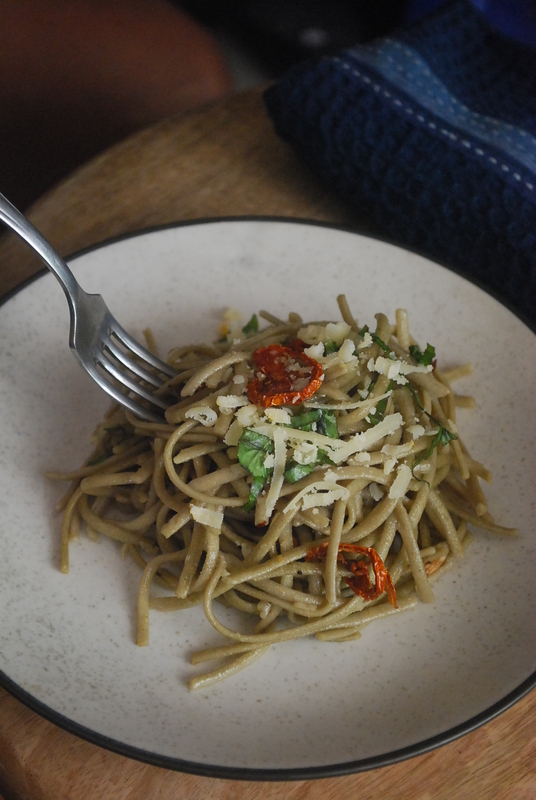 Pasta also has a low GI if made from wheat and also depends on the shape, thicker the pasta, lower the GI. Al-dente is the best way to eat pasta and maintains its low GI. The longer you cook the higher the GI it has. Opting for whole wheat bread is a better choice. 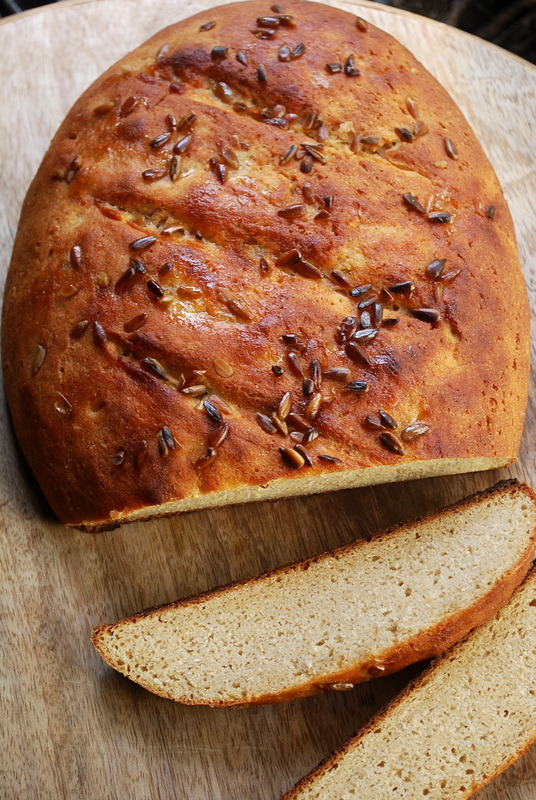 Baking your own bread is an even better option. GI ratings for some of the popular foods. i2cook.com sells some of the low GI products like coconut sugar, rolled oats, millets etc. 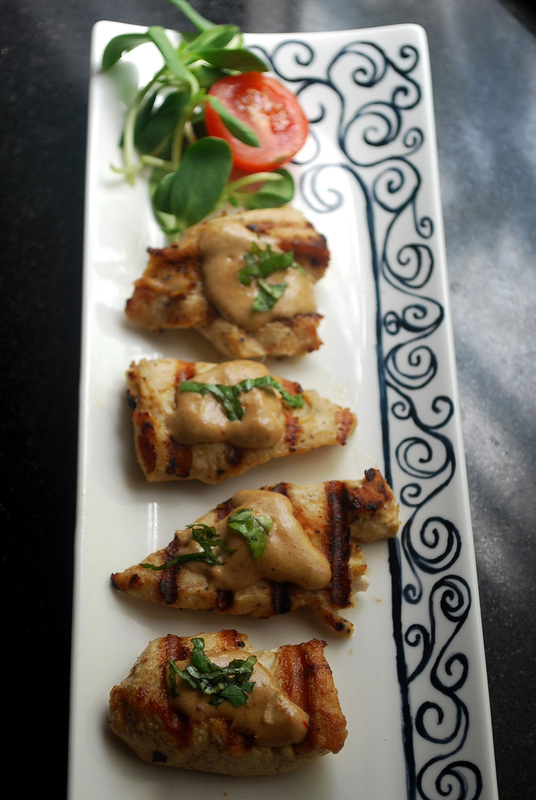 Grilling lean meats like chicken is a more healthier option. Disclaimer: the above research has been done some through personal experimentation and online research. If you are diabetic, I suggest you consult your doctor for low GI diet.